Unlike your Starbucks specialty drinks with froths of whipped cream and differently themed sprinkles, Dunkin’ Donuts’ new lineup of Girl Scout-cookie flavored coffee drinks is pretty straightforward. No candy bits or adds of any kind, just flavored coffee that taste like three popular Girl Scout cookies: Thin Mint, Peanut Butter Chocolate (Tagalongs), and Coconut Chocolate (Samoas), available either hot or iced. 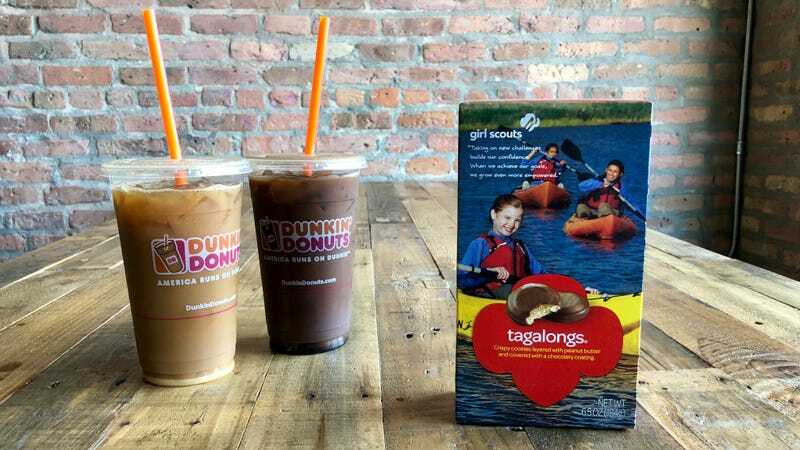 Why Thin Mints is the only Dunkin Donuts coffee able to be termed by its actual Girl Scout cookie name is for greater legal minds than ours to figure out. Since I’ve been eating these cookies steadily at home for weeks now, and never ever start the day without coffee, I considered my palate expert enough to be able to judge the new lineup. The major flaw in my genius plan: I am not a fan of sugar in my coffee, and all of these drinks were so sweet, that was pretty much all I tasted. Hot, iced, peanut butter, mint, coconut: Each one was just like a sugar-covered punch in the face. The woman behind the Dunkin’ Donuts counter asked me if I wanted cream or sugar in any of my selections as I bought them all; thankfully, I said no, otherwise I doubt my resulting sugar buzz would wear off before the spring thaw. Fortunately for me, I work in an office with a bunch of people who like sugar, and many of them, it must be pointed out, are writers of a comedic sort. So I drafted a bunch of them to help me discern the difference between these hideously sweet flavors. We started out with the eventual clear winner, the Coconut Caramel. Under the sweetness was a certain richness, so that it tasted really great for about a whole second. One taster commented on the strong “artificial aftertaste. I’m like… coconut? Nah, chemicals.” Another friend was more of a fan, but admitted, “I love fake coffee.” He was in the right place. Still another taster pointed out that she couldn’t really taste the coconut in the coconut coffee, correctly discerning that it tasted more like “butterscotch.” Taking another sip, I was inclined to agree. Even though it was a bit mislabeled, the Coconut Caramel was definitely the most palatable of the three. “It’s like it wants to be peanut butter,” said our fake coffee enthusiast. As weird as peanut butter coffee sounded, I was more of a fan because at least it was less sweet than some of the other options. “It may be less sweet, but it doesn’t taste like anything,” someone pointed out. The rest of us were inclined to agree, although one person threw out “hazelnut,” which seemed like a decent comparison. But here was a better one: “It’s like you poured a coffee into an empty jar of Planters.” These young comedy writers, I tell ya. All of these coffees had a lovely aroma, but that heavenly flavor was extremely fleeting as soon as you chugged some. The Thin Mint in particular greeted the imbiber with way too much sugar for one person to be able to handle. Then, just as quickly, the sugar would dissipate and you would be left with something that brought to mind “water, really” said a taster. Another agreed, “It’s like you made cucumber water but used a thin mint instead of cucumber,” which is a much more spot-on description than I ever could have come up with. This coffee loses points for disappointment. After all, Dunkin’ Donuts recently won our office Taste Test for chain coffee. And I think you’d have to go pretty far to find someone who did not agree that Thin Mints, Samoas, and Tagalongs are delicious, making the Girl Scout cookie season one of the finest of the year. But this unholy sweetened lineup only shows that combining these two exemplary things is a horrible idea. Upside though: Our office was unusually productive for the rest of the afternoon due to everyone’s intense sugar rushes. What&apos;s the best way to keep coffee beans fresh?